Also Recommended: Monster Musume, Dog Days, Keijo!!!!!!!! Notes: Based on an upcoming mobile game by Cygames. In this world, racing horses of old are often reborn as horse girls, and with their greatly heightened abilities on the racing circuit and desire to just run, have the opportunity to take part in specialized races and even attend academies centered around the sport. I generally don't mind optimistic, can-do sport shows. While I don't necessarily think everything has to be about competition to be number one, in sports, it's kind of a given that that is what you have to aim for. In a sense, I also appreciate that shows like this tend to avoid the rampant amount of corruption that sports tend to attract, even if having it would've been more "realistic". Uma Musume ~Pretty Derby~ aims to be this positive experience, and I can certainly respect that. It feels a bit like Keijo!!!!!!! !, except for the almost near-absence of fanservice and its almost relentlessly innocent lead (whose nevertheless quite able to tell when someone is acting like a pervert.) However, while sports academies are certainly a thing, you'd think an academy like that would delve more into the historical aspects of the sports of racing and how the horse girls themselves enter the equation, given their vastly superior abilities compared to regular humans. But what we see from the classes is mostly the girls having to remember various factoids, like the names of the kind of races they will enter and what the qualifications are. To be fair, we're here to see them run, but I would still appreciate some added depth. On a more hilarious note, all the girls seems to have inherited the mildly ridiculous naming theme of real-life racing horses. Our hero is named Special Week, while her idol is named Silence Suzuka. Other names of note is El Condor Pasa, Gold Ship, Seiun Sky, Grass Wonder and Symboli Rudolph, and that's just the tip of the iceberg. As for Special Week herself, the show plays her role out almost depressingly safe. Her introduction is basically arriving at town and being obnoxiously and loudly excited about everything, and then proceeds to lay out her only really "special" trait: she's a country bumpkin, sort of, and that's very intentional. She doesn't really stand out, which is such a definite design trait that it almost makes her uncommon among all these eccentrics. But, apparently, she's packing so much raw talent and absurd amounts of endurance that it makes up for her being a bit of an idiot, albeit her adoptive mother's training certainly helped too. She's a bit like Brave Witches Hikari, come to think of it. 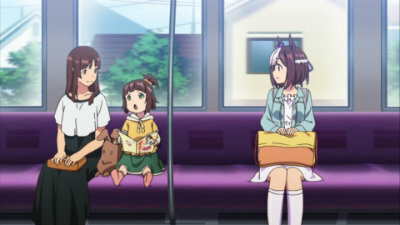 We learn already in the second episode that Special Week's mother was another horse girl, which means that she's one of the very few, maybe the only, horse girl who isn't a race horse reborn. 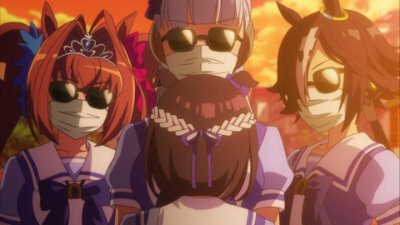 Uma Musume never does anything with this revelation, though, which either has to do with this show being only 13 episodes or it expecting this revelation to be enough. Which is a bit of a laugh, since it sees fit to beat us over the head about everything else. If you're wondering why I'm not talking about any of the other girls, then that is because none of them rise to the occasion with the exception of two: Silence Suzuka and El Condor Pasa. Silence Suzuka is quickly introduced as Spe-chan's idol and role model, a role she carries fairly well, even getting to be the center of the big dramatic moment in the middle of the show. El Condor Pasa, on the other hand, becomes Rigel's star player. Yet, she still remains on good footing with Special Week and the other girls. Most of the remaining girls are usually there to function as a temporary barriers for Special Week to overcome, even if she has to lose to them at least once first, or to be comedic relief-based teammates. Or "redshirts" for her to pass as they go "I can't do this!" That leaves the trainer, and he did not make the best of first impressions. His first appearance is basically his hands fondling Special Week's legs, and I have to question whoever thought THAT was a good introduction to his character. It's like the mentality behind it was "Ha ha it's like sexual harrassment but not really", but mostly, it leaves me puzzled why someone thought it would make for good comedy. 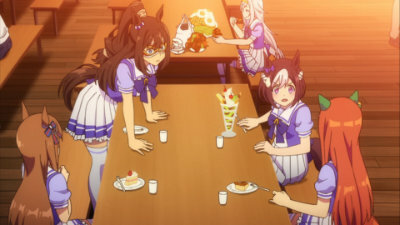 It doesn't happen often, but aside from the two times it happens during the opening episode and the one time later, Uma Musume also decides to make this its ending gag. Yes, I know; the whole idea is that horse trainers DO check the legs of horses in their employ one way or the other, and the joke is that it would look wrong if you do that to a human... except from a medical standpoint, it would make sense for doctors and medical personel to do this even with the girls, except it would be done with their full consent. And, since all the horse people are female, leaving the option for any of them to choose a female doctor if they are uncomfortable with being touched by a man. But no, this needs to be turned into a joke. It's especially egregrious, since Trainer-san -- I'm sure he has a name, but I don't think we ever hear it -- is otherwise... well, a bit of a stereotype on the renegade teacher who doesn't play by the rules, but rather lets the horse girls run their own race and just nudges them in the right direction in subtle ways instead. His character would actually be very sympathetic if not for his bizarre habit of feeling up horse girls, and since that's the first thing we see him do, it's going to taint his every action after that. More than that, he has his own frienemy in the show in Hana Toujou, team Rigel's trainer. Their interactions seem a bit unfriendly at first, but they clearly have a past together, and she even helps him set up a practice race with her own girls, which she isn't really obligated to do for one of her direct competitors, especially the one who "stole" her own star player, Silence Suzuka. The show also quickly establishes that a winner's privilegie is the chance to perform on stage as an idol, and I have to wonder why we need an idol aspect added to this. Yes, if a horse girl places on the podium, she gets to perform a particularly asinine idol song about soaring in the sky, fulfilling dreams and whatnot. And while the main show thankfully doesn't waste too much time on this nonsense, both the opening and ending theme are two such songs. 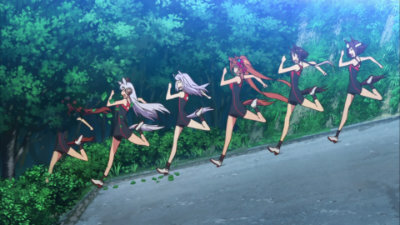 It's bad enough that running itself has become somewhat of a metaphor for moving ahead in life, and anime openings in general are saturated with people running. 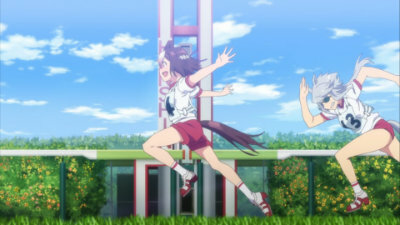 Since Uma Musume is all about the sport of running, it feels a bit more natural here. The comedy tend to vary between physical gags and dry observations, and is a bit of a hit and miss. Sexual harrassment aside, a lot of the comedy is centered around the girls' personalities, which works fine between the more developed girls, but not as much when it comes to the ones whose sole trait is being comedy relief characters. It does help that almost all of the girls are relatively positive and supportive, which makes the show much easier to digest, even at its most asinine. It does fail a bit at dramatics, though, mostly because Special Week's progression towards her dream doesn't really feel all that earned. It's the sort of show that could've used more episodes, as Special Week's journey from complete newbie to one who is able to defeat world champions sort of just happens. And then the show just negates all that effort we aren't getting to see with information that anyone just wins whenever they feel like it, and that's not even getting into what happens in the 13th episode of this show, which serves as more of a wind-down episode after the main event. 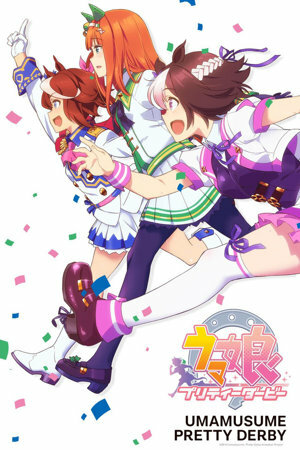 It's not completely out of the realm of realism -- I've watched enough sports to see that victories, accidents and everything else can be surprisingly random, even among top stars -- but it does give the show a sense of shallowness that the idol aspects of Uma Musume isn't helped by in the least. Uma Musume also has quite decent production values. A lot of the races, particularly the high-stakes ones, are actually quite exciting, with some good running animation on display, and some good sound design enhancing the portrayal of power the horse girls have in their legs. And for some weird reason, the show is quite adept at wielding a certain feeling of impending doom, particularly during said dramatical upturn in the middle, but also near the end. 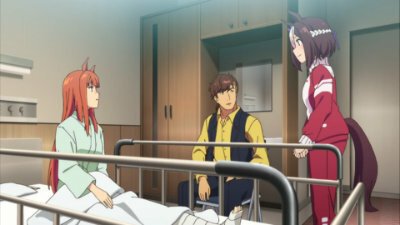 In a weird way, the show both makes light of serious injury and plays it straight, letting it fuel the recovery process, leading to one of the more amusing gags of the physical variety. And it's an old one at that. 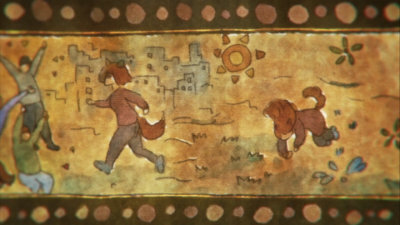 Most of the big moments tend to be put all front and ender, though, with a lot of the mid-run stuff turning significantly more lax in animation. Our old friend, the speed lines, also sees a lot of use, and not always for the best. Still, the show is generally animated well enough that it enhances the levels of adorable... ness.. of the girls themselves, which helps our main character develop some personality and also makes it much easier to like Team Comic Relief. I feel like I'm being pulled in both directions with Uma Musume. On one hand, I do enjoy the friendship and camaderie between the girls, even those on opposing teams, and I think the show does a decently good job at portraying the sport itself. Special Week makes for a compelling lead, and even just the aspect of horse girls in general makes sense when it comes to what they do. On the other hand, the main story could've stood to be developed a good deal more than it was, and the less said about the "bright" idea to have Trainer-san feel up girls right out of the blue, the better. And granted, I've never made a habit of hiding my distaste for the idol industry and the shows made solely to promote them, their presence in Uma Musume still comes across as massively unnecessary. Although, to be fair, my distaste to the music is more of a matter of taste -- the problems I have with the industry is that it sort of encourages creepy behavior that has already lead to dangerous situations for many of the girls who are a part of said industry, never mind the way it takes control of these girls lives. 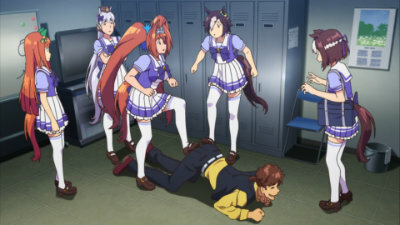 In Uma Musume, it just feels redundant, and doesn't really add anything to the show itself. The show is being weirdly self-aware of this too, as there are only a bit of said idol performance stuff in the first couple of episodes, before the show seemingly forgets all about that part until the very final episode, where a highly unlikely conceit leads to a rather "grand" performance. Recommended Audience: The show is mostly bereft of fanservice aside from a few scenes of the girls in swimsuits of the sports kind, and even then, Uma Musume isn't really aiming at being sexual. There's also the bizarre decision to have Trainer-san feel up the legs of horse girls right out of the blue. Any violence is mostly just slapstick -- Trainer-san being kicked for touching horse girl legs or Gold Ship being on the receiving end of her attempted pranks towards someone else.